If you haven't checked-in with Olympus OI Share (2.4) for a while, the app has evolved into a full-featured remote control for WiFi-enabled PENs and OM-Ds. I'm using it with my Olympus OM-D E-M10 ($699) with the 14-42mm f3.5-5.6 EZ zoom ($349). More on the lens choice in a moment. OI Share works on both smartphones and tablets, and it enables you to set exposure mode, white balance, exposure compensation, drive mode, ISO, and of course, trip the shutter. 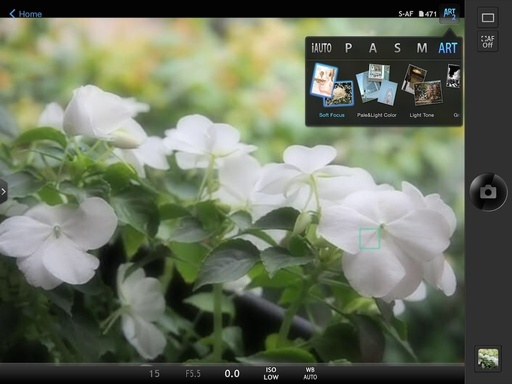 The application is organized into four basic areas: Remote Control, Import Photos, Edit Photo, and Add Geotag. My focus here is the Remote Control mode. Set up the app by tapping on the gear icon in the upper right corner to reveal Settings. Tap on Remote Control. One of the defaults that I change is Live View Quality. Out of the box, it's set for Speed Priority. But I think the image on my iPhone or iPad screen looks terrible with this selection. I recommend Image Quality Priority. Unless you're having performance problems, it makes capture far more enjoyable to view. When it's time to take pictures, enable WiFi on the camera and set up your mobile device by scanning the QR code on the camera's LCD screen. Keep in mind that you need to access the WiFi network that the camera creates in order use remote control. Then launch the OI Share app. If you have a power zoom lens (which I recommend for remote use), then you can zoom in and out by using the control that appears on the left side of the screen. This is very handy for fine-tuning your composition when you're not within reach of the camera. Tap on the Exposure Mode Control in the upper right corner, and review your options: iAUTO, P, A, S, M, and ART. Take a look at Art Filters and experiment with your options. Some of those effects might get your creative juices flowing. If you shoot RAW+Jpeg, the RAW will remain untouched and the Jpeg will display the Art Filter effect. It's the best of both worlds. Not only do you have the standard single frame and burst mode options in the upper right corner, but Olympus has added some nifty self-timer settings. You can delay the shutter release in increments of 2 seconds with a range of 12 seconds to 2 seconds. As an added bonus, you can set multiple exposures and the duration between them too. 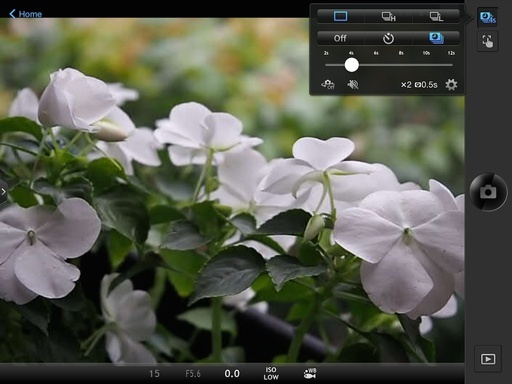 You can tap the screen to set the focus point, or initiate the shutter. And once you capture your images, save them to the Camera Roll to share online. The original photos remain on the camera's memory card. OI Share is available as a free app in iTunes and Google Play. It is the robust remote camera control that we once dreamed about. Olympus OI Share has a high Nimbleosity Rating. What does that mean? You can learn about Nimbleosity and more by visiting TheNimblePhotographer.com.